Then we warmed up, got rain and washed it all away. Today, the cold came back and it flurried very prettily. I love Sundays as many of you who know me, know. But add snow flurries, the need for a fire in the fireplace, no need to go anywhere, a project to do, something simmering on the stove….and it’s really a Perfect day!! I’ve been very busy doing my Imbolc cleaning which also involves major purging of unwanted and unneeded items. It feels so good to see all that “stuff” going out of the house! I take one room at at a time. Empty drawers, cupboards, cabinets, closets etc and really sort through. I find myself getting more brutal about what needs to go as I go along too. When we moved to this home three years ago, we came from a much bigger house that held a lot more “stuff”. We got rid of so much stuff then ….out of necessity of not enough space since we had downscaled. But after 3 years, as I’m looking through things, I realize there are things I haven’t touched in the 3 years we’ve lived here. So…out they go! I have also been working on some BOS pages, journaling, working on my herbal course a bit, spending more time with my grandkids who are homeschooled and more available, and really just nesting. I am about to dive into my Witch cupboard to give it a thorough cleaning, cleansing, and re-arranging. I have bought some gorgeous, new oil bottles and herb jars and I’m anxious to get them set up inside my cabinet..to replace the mish mash of stuff that’s there now 🙂 I can’t wait to start blending oils for each pretty bottle! I have a list of what I’m making from simple rosemary oil to Sabbat blends to my favorite altar oil. I so love doing that! Planning on starting tomorrow! I’m also going to make some salt blends as well. Right now, for Winter, the dark time, I’ve got my altar set up to honor my beloved Goddess, Hekate. I find myself drawn to it several times a day and that is a good thing. I’ll keep it up until I’m ready to set up my Imbolc altar, which won’t be too long now. Winter…I know so many who find it to be their least favorite season. But other than Autumn, I find it to be especially beautiful. I love hearing the wind blowing. There is great magick there, in the Air that is either cold, still and quiet, or blowing and frigid. On quiet nights, I love to stand outside seeing the inky black skies with bright stars, see my breath on the Air, smell the woodsmoke from the chimneys in my neighborhood, see the lights shining in the windows, feel the quiet of the ground beneath my feet. The silence is often palpable…and beautiful. I know that Mother Earth is resting, renewing, preparing to awake in the Spring and bring Life back to this wonderful Earth we call Home. I especially love the trees in Winter. There is something so mystical about a tree, bare of foliage, standing dark and stark against white snow and dark skies. Or blue skies for that matter. Either still and quiet, or standing strong against blustery winds and snow. The shadows they cast long over the snow, always catch my eye. You can feel that they too, are resting, waiting. In my garden beds, there are still plants that had re-bloomed in our late warm days, and now stand snow covered, withering, but leaving the promise of returning bigger and stronger in the Spring. Some of the tall ones provide shelter for birds and ground animals which I love. There is beauty there as well. LOL…I so love my seed catalogs! And yes, I’m already planting my herbs and flowers in my head. How about you? I’ll be back soon with a post for Imbolc and some recipes 🙂 For now, be safe out there, remember to take in the beauty of the season, find something you love to do, and slow down and enjoy!! *All the pictures in this post are my own. Merry Meet my friends! It’s a gloomy and chilly day here today in Ohio. We had several days of rain to the point of flooding in some areas…including my own backyard! The rain is gone for now, but the gloom remains. I’m home today, at least until this afternoon. I have Blackmore’s Night playing, a fire in the hearth, laundry going, and decided I had time to do a blog post. Now, we head into a new year! For us Pagans and Witches, Our New Year officially started at Samhain, but having said that, there is much to celebrate about a new calendar year! There is something about counting down the last of 2015 and knowing that 2016 is here. For many, it’s time to re-evaluate our lives. Many of us look back on the last year and see things that were great and things that can be improved on. Some of us set goals or resolutions for the new year. Maybe we want to improve our health, our relationships, our jobs, our attitudes, our love life etc. Maybe we are still healing from illnesses or losses. I do all these things. But I do them kind of constantly, not just at the new year. I don’t set resolutions, but I always have goals in mind. I think most of us do. After all, we grow stagnant and boring if we don’t have something we are striving for! Don’t you think? The start of a new year is like having a a brand new clean calendar of days ahead of us. We can jot in, fill up our days with whatever we want! You choose whether they are filled up with empty days of daily drudge, unhappiness, inactivity, and anger etc. Or…we can fill them with joy, love, happiness, activity, learning, and finding time to do the things we love. I’ve talked about this before. Years ago, I read a book about changing one thing in your life to start yourself off on a better way of Life. It was a profound thing for me. Think how easy it is to take that first step….just change one small thing to start! For instance, you want to be healthier in 2016. If you need to exercise, try walking to the end of your street and back to make a start. Or sign up for a yoga class or look one up on Youtube. Or get a step monitor and pay attention to how many steps you’re getting in each day. Want to lose weight? Maybe stop drinking sugary drinks first….or cut down on bread and sweets, or don’t eat after 7:00 at night. Want to improve a relationship? Invite that person to have coffee with you, or make a long overdue phone call. Want to get a better job? Make a list of what works with the job and what doesn’t. Is there one thing on there that you can change to make it better? Or maybe take a class ..something that will lead you to your dream job. Tired all the time? Figure out how to get 30 minutes more sleep..in a bed! Not in a chair in front of the tv! (a mistake many of us make lol) These of course are just basic ideas, but you get the picture. One thing I changed for myself was that I realized I didn’t have enough time to myself. Just quiet, by myself time. What one thing did I do to fix that? I got up earlier to have time in the morning to myself. Then I decided NOT to get on facebook first thing, but to journal or read, or practice my Craft in a simple way. Now, it’s a regular thing with me that I look forward to and very much need in my Life. It has improved my mood and my day immensely. And it was just realizing what I needed, and devising a way to get it! No matter how wonderful our life is, or how not wonderful it is for that matter, we can improve our lives by making choices. My next step, to make time to get that herbalist class done..to make it a part of each day or a few days a week to get that certificate I’ve been wanting for too long! Also, I have been losing weight for nearly 10 months now and I have a bit more to go..but I’m getting there! Adding in better exercise will be a priority as well. I know that is something I NEED to do to get all the way healthy! I am 57 years old, heading to 58. I’ve learned a lot in those years, and still learning. The main wisdom I’ve garnered? We make our life what it is. We can not blame other people or circumstances for what is right or wrong in our lives. It’s up to us not to allow that to happen. If your life isn’t as you want it…change it. Other things I’ve learned…always be grateful, find happiness in the small things, take time for our loved ones and relish every moment of every day! There is beauty all around us if we look for it, and listen to your inner Goddess/Spirit/Guide always! Let’s look at 2016 as the year we’re going to do something wonderful in our lives! I’d love to hear what it is you would like to do? And by the way, it’s a goal, not a resolution that gets broken immediately. A goal is a long-term thing..at least that’s my take on it. We strive to meet a goal, no matter how long it takes or how many set-backs we have along the way. It’s the working to get there that leaves us happy and satisfied. Merry Meet my friends! It’s Thursday morning and Samhain is Saturday. I can’t believe how fast October has flown by! Too fast! I’m sitting in my family room, listening to a Halloween Radio sta tion on Pandora, watching leaves blowing around my yard, the Sun shining and birds at the feeders and chipmunks and squirrels gathering. It’s a gorgeous day after two days of much needed rain. Quite cool, quite autumnal, and I’m feeling happy and blessed. My gardens are a wild mess. The last of the Autumn flowers are spent. The tall grasses are brown and dry. Some herbs have re-bloomed like parsley, thyme and lemon balm. (I’ll be grabbing those yet) My rosemary and lavender are still healthy and useful as I trim some rosemary for my ancestor altar and Ancestor Supper table. 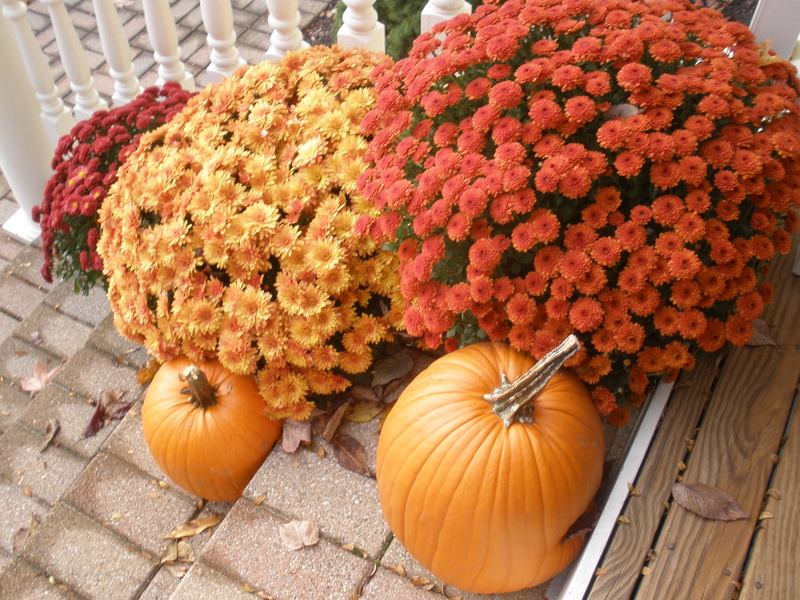 There are dried leaves gathered in the beds that will remain to keep warm the plants over the long Winter, and fresh, bright colored leaves are still falling, littering the ground and beds with reds, oranges, and golds. I took a walk in my favorite park that has a beautiful pond. 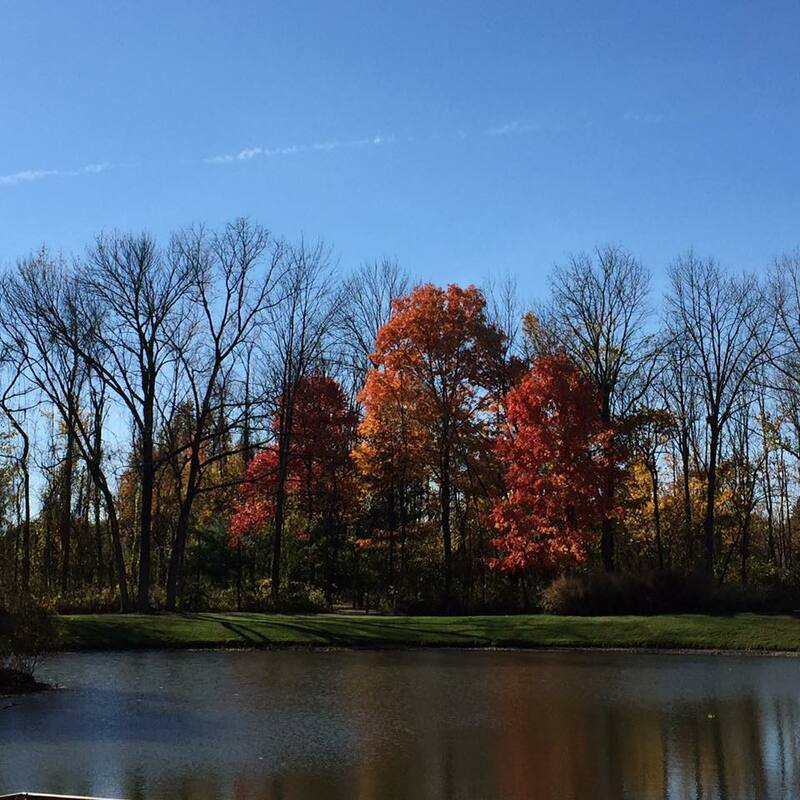 Watching the geese fly over under blue, clear skies, the leaves floating in the pond, the bright trees and Sun casting mirror images on the water, I’m reminded of how Mother Earth is winding down to the dark, stark season in a blaze of color and beauty. I never have the feeling it’s a death and dying thing..but a show of how beautiful the seasons are. No matter the season, they each have their own beauty. While Autumn to me is the most beautiful, Winter too can be stunningly filled with beauty and I am not sad that Winter comes. I have enjoyed the energy of the Full Moon these last few nights, even though I couldn’t see Her the night she was at her fullest. The foggy, rainy days reminded me of the thinning veil. The mystical, quietness of this time of year, if you’re still enough to notice it. I’ve been having strong, vivid dreams and vacillate between sleeping hard and feeling restless in the night. How are you feeling? Perhaps tired and restless? Or calm and filled with energy? I find I’m energized most of the time in Autumn, but an evening by the fire can make me feel drowsy and content. I find my loved ones who have passed on are very much on my mind and I’m trying to be aware of any messages they may be bringing for me, to be aware of their being close to me, and to leave myself open to any other guides/spirits who may be needing my attention as well. I keep a dream journal and I’m jotting down anything I remember when I awake. My scrying mirror, tarot cards and candle and fire flames are readily available to such purposes of receiving any messages. As I said in my last post, I find being still and meditative, even drowsy, can bring me closer, easier to my loved ones. My coven gathers tomorrow night. Always such a high energy, loving, magickal night. We’ll be doing an ancestor ritual, welcoming in the New Year together, with feast and fire. While we enjoy every Sabbat gathering, and every other gathering, Samhain is always just the best one. The energy of Samhain is very much within us as a Tribe. I love my sisters! I have been visiting some books lately for the Season. Classics like Edgar Allan Poe poems and “The Halloween Tree” and getting ready to read “The Picture of Dorian Gray”. I also have been enjoying movies like “Hocus Pocus”, “Sleepy Hollow”, and “The Good Witch” movies. My daughter, our friend and I saw “The Goosebumps” movie last night and enjoyed it very much! I love both books and movies during this entire holiday season, from Samhain to Yule. Music too. They just put me in the mood! What are your favorite spooky books or movies? Cooking and Baking also is such a big part of the holidays for me. Autumn is especially lovely with warm soups and breads, apple and pumpkin desserts, and hot drinks with cinnamon and spice. If you do a search in the box on the right here —–> you can find previous Samhain recipes for the last 5 years. I’m going to add a couple more today. Also, if you saw my last post, you may have been checking out Samhain’s Sirens and The Sunday Stew for other recipes from myself and others for the Season. For many, All Hallow’s Eve will bring to mind a witch stirring her cauldron 🙂 Well, yes, that’s me! Conjuring in my kitchen! I may have a soup or hot cider in my cauldron, or I may have herbs and a smoking charcoal just as easily. If you don’t have a nice cauldron to actually use in your kitchen..I highly recommend a Potje pot. They come in all sizes and are wonderful! As a reminder of the foods for Samhain, they are : Apples, pumpkin pie, pomegranate, pumpkin, squash, hazelnuts, corn, bread, ale, apple cider and herbal tea. Here are a couple of new recipes to fit the bill. One is healthy and one is just sweet and yummy! 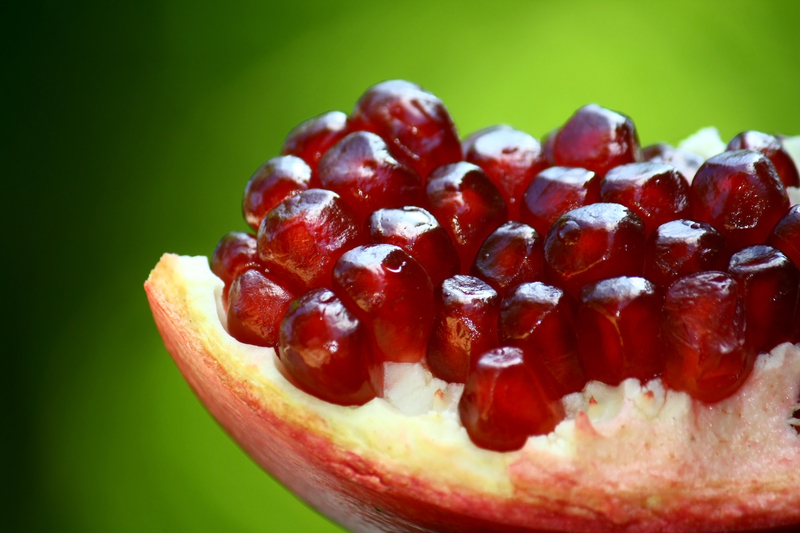 In a small saucepan, boil pomegranate juice until reduced to 1/4 cup, 5 to 6 minutes. Let cool. Whisk in lemon juice, oil, salt, thyme, and pepper. In a salad bowl, gently mix spinach, radicchio, pomegranate seeds, and hazelnuts with dressing. Divide among 6 plates. Quarter pear and core. Thinly slice crosswise, then stack slices and cut in matchsticks. Arrange pear on salads. *To make this salad a full meal, add grilled chicken strips onto the salad and a good crusty bread! 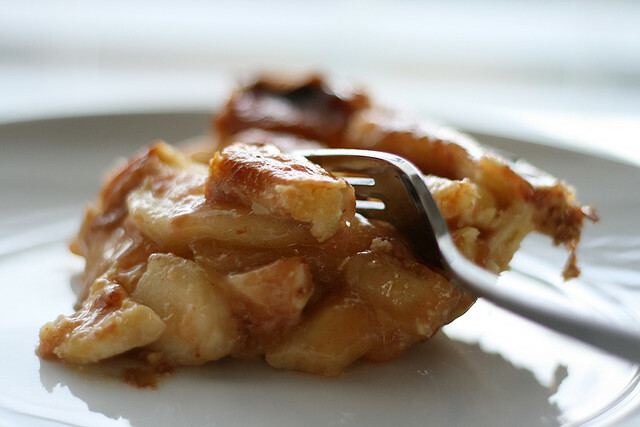 Place pie crust in a 9″ pie plate; arrange apples in bottom of pie crust. Combine 2/3 cup sugar, 2 Tbs flour and salt in a large bowl; stir to mix. Add sour cream, egg and vanilla. Beat with an electric mixer at medium speed until smooth. 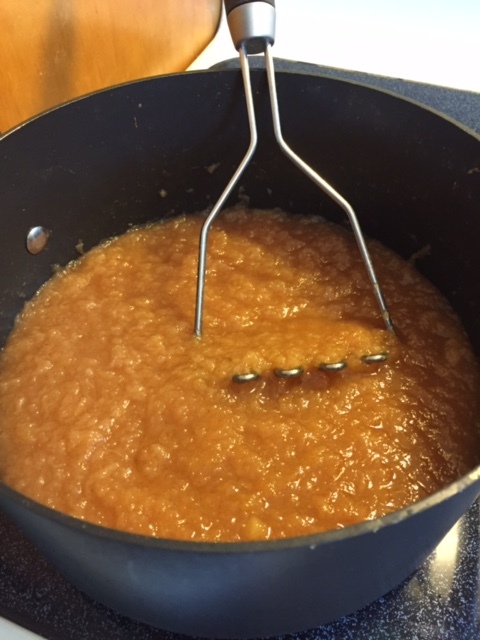 Pour mixture over apples. Bake at 425* for 15 minutes; reduce heat to 350* and bake 30 more minutes. Combine in a small bowl the remaining flour, sugar, cinnamon and butter. Sprinkle over top of pie. Increase heat back to 400* and bake 10 more minutes. Remove and cool. Of course, eating it warm is perfect! 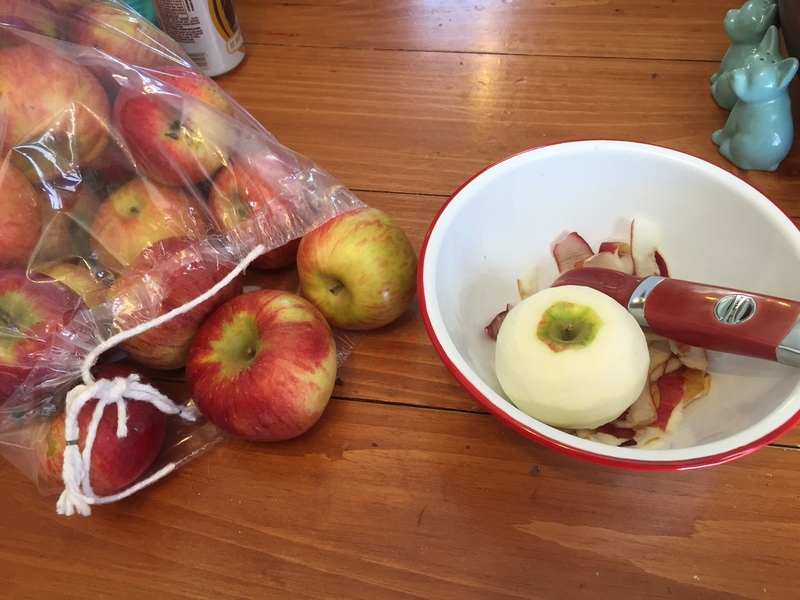 *If you’d rather use thinly sliced apples, that is okay too. Well there you go for a couple of great new recipes. Again, you can find so many more of my recipes in previous postings. Whether you’re looking for a simple soup meal, a big feast or just something sweet, you’ll find it here 🙂 Enjoy! I want to wish you all a very Blessed Samhain and Happy Witchy New Year. May your ancestors be blessed by how you live YOUR life, how you honor them and how you loved those you knew who have passed beyond the veil. And may YOU be blessed with a full new year of wonderful things ahead! Remember to let go that which no longer suits or has meaning or purpose, and find joy in what is to come. Make it GREAT! Hail! We see them now come through the Open Door. To move out you must move in. Mine the spark within them laid. Merry Meet my friends! It’s been a bit too long since I’ve posted anything here on my blog. As you all know, Autumn is my favorite time of year and I’ve been very much enjoying all the pleasures of this beautiful, magickal season! We’ve had temps anywhere between cold, frosty mornings to unseasonably warm afternoons..like today! We went from 32* a couple mornings ago, to 74* today! It’s typical here for Ohio though lol. I love it either way. 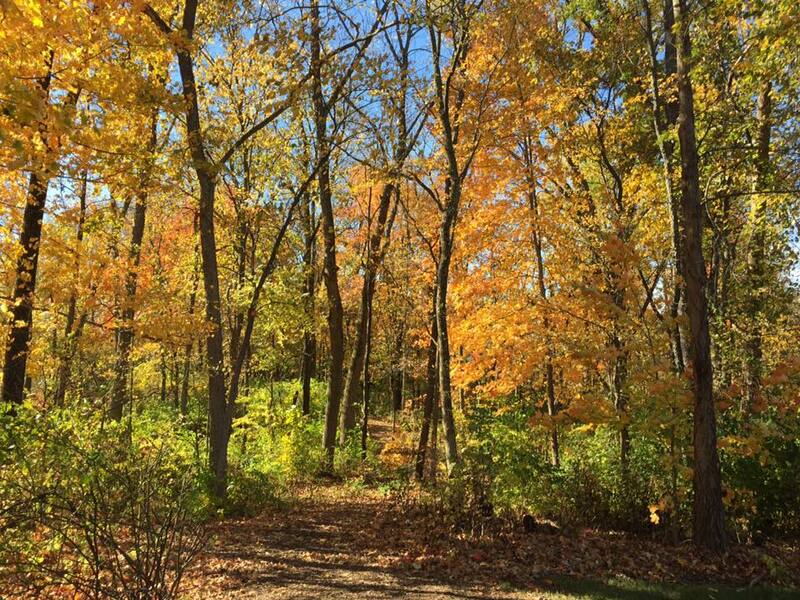 We are at peak color or close to it and it’s a brilliant year for color. 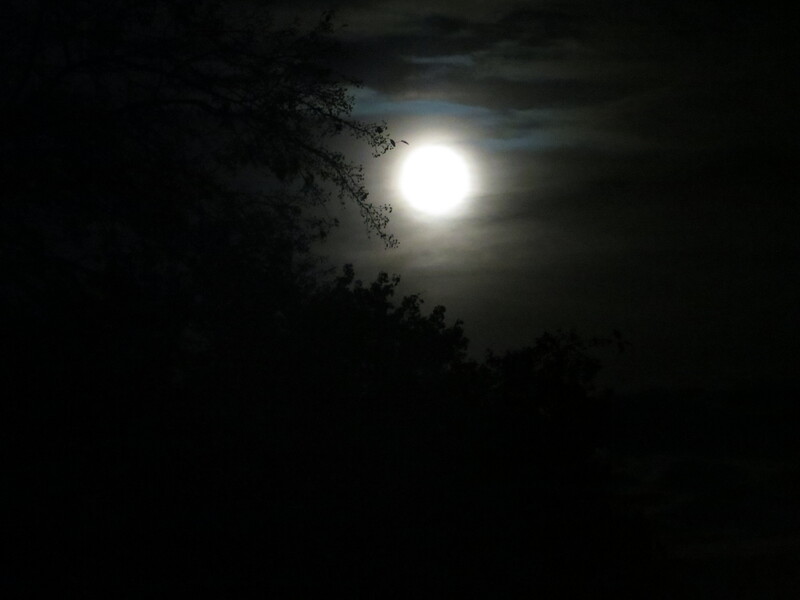 The skies have been clear, with star-filled, Moonlit nights that I love so much! Crisp, autumn days with leaves crunching underfoot and falling in colorful waves upon the ground, pumpkins grinning from porches, and you gotta love sweaters and scarfs coming out again! I’m in my element that is for sure!. I’m energized and content! I hope that you all are enjoying the lovely season too! Whether you are coming into spring in the southern hemisphere or the fall here. I also hope that you have been reading and enjoying Samhain’s Sirens this month! You will find amazing bloggers, music, information, pictures, recipes, crafts, give-aways and so much more! My recipes are there on most days, so if you’re looking for wonderful Samhain recipes, you need only look there. The link is on the right side of my post over there —–> You’ll love it! The veil is thinning as all witches and pagans know. Our ancestors and loved ones wait to connect with us, to share with us, to impart knowledge and love to us. We have only to listen. I have many friends who have lost loved ones recently, as I have, and I know they look forward to feeling them close again. Even our beloved pets. It’s what Samhain is all about for me. That connection to our family, friends, ancestors, and guides. There are many forms of divination of which to use to this gain….but I find a quiet flame and quieting my mind, opening myself to them, is all it takes. What is your best way? Scrying? Tarot? Meditation? ….There are many. I’ll be setting up my altar with many tools for that purpose, but being quiet and listening is the main thing for success, I have found. I hope that you are so blessed with a visit from those you seek the most….and maybe you’ll discover someone else who is trying to reach you too! Be open to all possibilities! 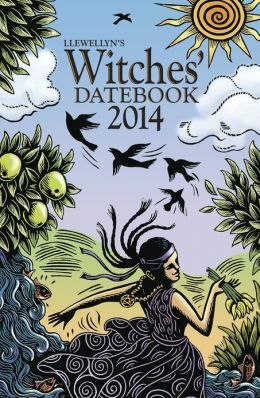 Samhain is also the Witch’s New Year! We wind down a year of Sabbat celebrations, of Moon phases from new to full to dark. We have gone from cold, long nights to hot, long days. We’ve had meteor showers, eclipses, Blood Moons, Supermoons and all the magick that we bring to our lives each and every day. The New Year is a time to celebrate our past year, let go of those things unwanted..both physically and mentally, and look forward to planning our next year. It’s a time for looking back and looking forward. I find myself getting ready to nest in. Even with the upcoming holidays, it’s knowing the dark season is upon us. Being by hearth and fire during long, dark, cold nights can be cozy, introspective, productive and filled with comfort and joy. Even if you don’t have a fireplace, fill your home with the warmth of candlelight, bake and cook things that scent your home with goodness, have warm blankets and cozy jammies you love, a stack of books by your chair, a project or two you’d like to get done, and maybe something new to learn too. Your winter will be wonderful. I always look at it as a time to work on myself, my home and a time to increase my knowledge on something I want to learn! 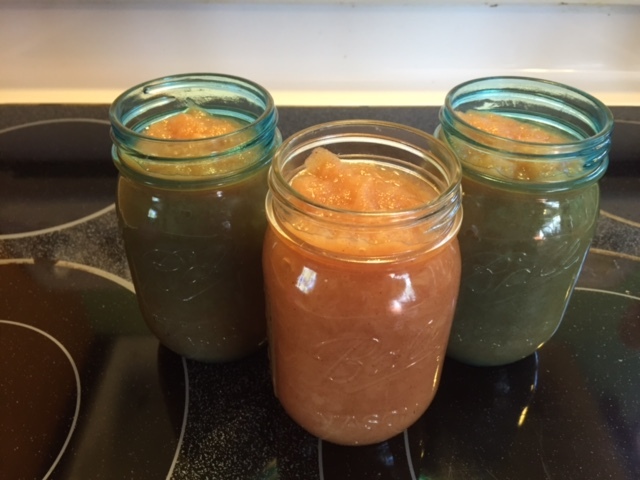 I thought you might enjoy trying the recipe too since apples are abundant right now…. so here you go! This is not the canning type of recipe. This is for immediate use. Jarred up, it should last a while in your fridge. Combine all ingredients in a large pot and cook over medium heat, stirring occasionally, for 25 minutes. Store in covered jar or plastic container. So easy and you will love it! Would be great in recipes calling for applesauce as well! Samhain is a magickal time. To me, the most wonderful time of the year. (now that song is going through your head right? LOL!) However you celebrate it, whether quietly or with full All Hallow’s Eve celebrations…enjoy it!! I’ll be back soon! Hello my friends! I wanted to do a quick post to you all today. Right now the Sun is shining but it is quite cold and windy out! We’ve had snow flurries all morning but no real accumulation.. it’s so pretty 🙂 Today, I’m completely relaxing! Much deserved! We had a wonderful Christmas (yes we gather with family for that holiday too 🙂 My extended family ..20 of us..were all here at my house, well behaved, jovial and a good time was had by all. Yesterday, I took down all the decorations, packed them up and with the help of my husband, carted all the boxes back to the storage room. A bit of cleaning and the house feels great. Uncluttered, clean and fresh! I love that!! I always love the decorations going up..and really love them coming back down again! lol. Today, I’ve pulled out my 2014 calendars. A wall calendar, my Gooseberry Patch calendar and my Witch’s calendar and have them all filled in, marked and ready to go. A whole year of days, hours and minutes and possibilities ahead of me! What a great feeling. I’ve also finished up a journal and will start a new one tomorrow..fresh pages…fresh thoughts….new days to write about. A clean slate…which is what the New Year is all about! For this New Year’s ..we are blessed with a New Moon..a rare thing! Now as Pagans and Witches, we all know what that means. It is a truly magickal…restart…boot up…new beginnings…dump the old, unused, unwanted..kind of day! Today, along those lines..I smudge the house well, throw open windows and doors (at least for a minute cause it’s so cold! ), scatter salt at doorways and sweep out all the old and negative and allow in the new and positive! Tonight, there will be food, drink and a fire with my husband and daughter Sara. I’ll burn that I want to rid myself of…old hurts, disappointments, angers, sickness, etc….and will then burn that which I want to bring into the New Year..love, friendships, positivity, health, happiness and abundance. Simple and meaningful. I want to wish you all a Very Happy New Year and I KNOW that 2014 will be an amazing year for you and yours! Thank you so much for being a reader, a friend, a loved one..whichever category you fall into 🙂 I am Blessed..very much in my Life by all of you! May you have all the good things in Life come your way..always! We will open the book. Its pages are blank. The book is called Opportunity and its first chapter is New Year’s Day. Happy New Year my friends…ready or not 2013 is here! 🙂 I have been so busy moving and setting up my new home, healing from a broken leg and of course doing all the things we ALL do for the holidays..I also didn’t get to send you all a Happy Christmas! I hope that you DID have a good holiday, that you were surrounded in Joy and Love, and that Santa was good to you! A good Christmas was had here..though it was hectic and very different because of the move. My extended family, my siblings and parents, always come to my house for the holidays. This year, they took pity on me and my situation and decided for each family to celebrate on their own. Whew! It took a big load of work off my shoulders! Christmas this year was just my husband, my daughters, son-in-law and grandchildren and we had a lovely time. A simple meal, exchanging gifts, a fire in the fireplace and fun! It was perfect and so much less stressful. It was a good thing! New Year’s Eve also was quiet. Just the three of us here at home relaxing. We puttered in the house..hanging new lighting and pictures. Hubby and I did a bit of shopping for breakfast bar stools and had lunch out. We watched the “Rockin Eve” shows on tv and just relaxed. At midnight it was hugs all around and off to bed!! Do you set goals or resolutions? My advice..make it simple and just one or two things. It’s easier to stick to it…and easier to accomplish. I talked about this before here on my blog. I read a book years ago…Change One Thing. It was life changing for me. What is that ONE Thing you would change? Maybe it’s to get up earlier and have quiet time to yourself, maybe it’s to go to bed earlier for more sleep? How about taking that class you’ve always wanted to take…or to start a new craft project? Organize your desk or closet? De-junk the house? Walk more, eat less? Read that classic you’ve always wanted to read or get a new job cause you despise your current job. The possibilities are endless and it’s just one thing 🙂 Try it!! I’d love to hear from you…what you might want to do different and how it works out for you! I hope 2013 brings good things to all of us. I truly believe we are on the cusp of a world-wide awakening. A call for a change in humanity..in how we all look at our world and each other. Compassion, Kindness, Caring, Love, Positivity, Help, Acceptance…these are what Life is really about. A higher awareness of what the Universe, God, Goddess, Buddha, Spirit..however you view the Divine…wants for us. We can be a Light to others.. leaders in the movement to a world that was meant to be! I plan on working on that most of all. Being a Light..Being Love. Many Blessings to you and yours for a most wonderful 2013…Make it a good year!! I spent New Years Day taking down the Christmas decorations and getting the house back in order. Then I spent the rest of the day relaxing by the fire, reading, and playing Words with Friends (my new obsession!). So all in all a wonderful holiday. Now, I move on to the deepest part of Winter. Now those who know me or read my blog…know I love Winter. I love it for the beauty of the snow, the restfulness of the long dark nights, the warmth of the fireplace and the slower pace and more days at home. I read and crochet to my heart’s content, projects around the house get done and caught up, and I have time to spend on myself a bit too. I call it “nesting”….and I find it necessary every year after all the busy work of the holidays! I also love to use the Wintertime to work on my Book of Shadows, organize and clean my witchy cabinet and replace any supplies I’m getting low on, like candles, oils, incenses, and herbs etc. I work on making up my witchy potions, loose incenses, and oil blends. I even collect snow for “snow water”. I find snow to have an amazing energy and I use it for my altar work. Basically, because Winter forces us to slow down and take it easy a bit, I have more time to do the things I LOVE to do ..that I don’t have time to do during the other seasons. This is why I love Winter! Now for New Year’s, I don’t have resolutions (I never stick to them) but I do set some GOALS for the next year. I seem to always have the need to have something I’m striving for…something to look forward to..something I want to change in my life to make it better. This year is no different. I want to start an etsy business and I’ll be working on that early this year. I’m always striving to live a healthier life..more exercise, to eat better etc. I am setting a goal also to take more time for myself and to do the things that make me feel good about myself..that give me joy..that keep me grounded and connected. Journaling, time for my craft, reading, finding time to be with friends, taking more walks, yoga, and planning my summer gardens are all on my list of things I want to do better 🙂 What are your goals for the New Year? Do you have any? If goal setting is not a priority for you that is fine of course. But maybe you are overwhelmed with all you’d like to do or to change in your life and don’t know where to start? In that case, I recommend you start with One thing. I read a book years ago..about how making one small change in your life..can set off a chain of change..like a snowball rolling downhill. Change one small thing and see what happens! Make it simple and easy. You’ll be surprised how satisfying it’ll be! My wish for all of you is that 2012 brings much joy, good health, prosperity, and beautiful days for you and yours. Happy New Year to you all! !